For his directorial debut, Rashid Johnson has shot an update of Richard Wright’s controversial 1940 novel about Bigger Thomas’ seemingly irrevocable slide into the void. The screenplay by Suzan Lori-Parks changes some of the novel’s key plot points—”It’s not the book,” Elvis Mitchell told a recent Film Independent audience at the Arclight screening in Hollywood—but the expendability of black lives in this new NATIVE SON is, tragically, still contemporary. As Bigger, Ashton Sanders (Moonlight) gives a performance of cool hesitation that recalls the voice and armature of James Dean and a young Keanu Reeves. For a scene at the home of Bigger’s rich, art-collecting employer, Johnson—in an audacious move—places his own 2015 painting Untitled (Anxious Man) directly behind Sanders as an angel/devil-over-my-shoulder figure. NATIVE SON—which premieres tonight on HBO—co-stars KiKi Layne (If Beale Street Could Talk), Bill Camp, Sanaa Lathan, Margaret Qualley, Nick Robinson, Elizabeth Marvel, and David Alan Grier. Film stills, from top: Ashton Sanders in Native Son (2019); Sanders and KiKi Layne; Sanders; Sanders and Nick Robinson (right); Sanders. Photographs by Matthew Libatique, images courtesy Sundance Institute and HBO. Film Independent photos, from top: KiKi Layne and Rashid Johnson; Elvis Mitchell, Johnson, and Layne. Film Independent Presents HBO Screening Series—Native Son, March 20, 2019, Arclight Hollywood, photographs by Araya Diaz/Getty Images. This entry was posted in ART, BOOKS/PERIODICALS, CONVERSATION, FILM, LITERATURE/POETRY and tagged Arclight Hollywood, Ashton Sanders, Barry Jenkins, Bill Camp, David Alan Grier, Elizabeth Marvel, Film Independent, HBO, If Beale Street Could Talk (Jenkins), KiKi Layne, Margaret Qualley, Moonlight (Jenkins), Native Son (Johnson), Native Son (Wright), Nick Robinson, Rashid Johnson, Richard Wright, Sanaa Lathan, Suzan-Lori Parks on April 6th, 2019 by Barlo Perry. This week at the Aspen Art Museum, Rashid Johnson will give an artist talk, and accept the 2018 Aspen Award for Art during ArtCrush, the museum’s celebrated annual summer benefit. 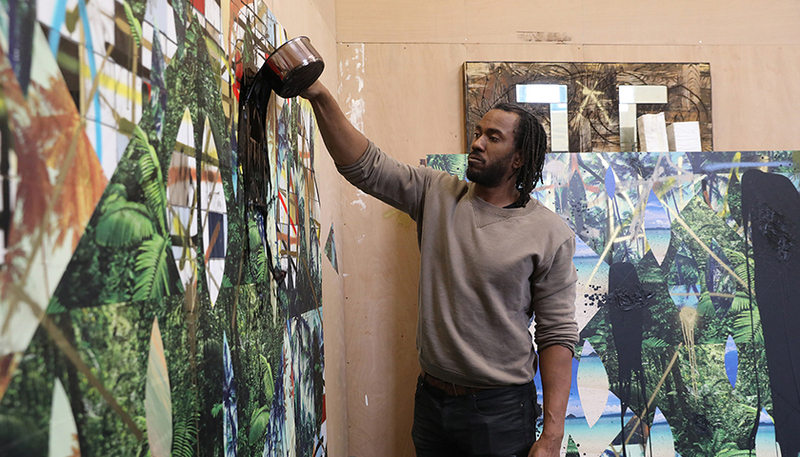 RASHID JOHNSON—ARTIST TALK, Thursday, August 2, at 5 pm. ARTCRUSH, Friday, August 3, at 6 pm. Rashid Johnson. Image courtesy of the artist and Hauser & Wirth. This entry was posted in ART, CONVERSATION and tagged ArtCrush, ArtCrush 2018, Aspen Art Museum AAM, Rashid Johnson on August 1st, 2018 by Barlo Perry. THE RAINBOW SIGN, the new Rashid Johnson sculpture and collage show at David Kordansky, will be up for one more week. RASHID JOHNSON – THE RAINBOW SIGN, through May 19. DAVID KORDANSKY GALLERY, 5130 West Edgewood Place, at LaBrea, Los Angeles. 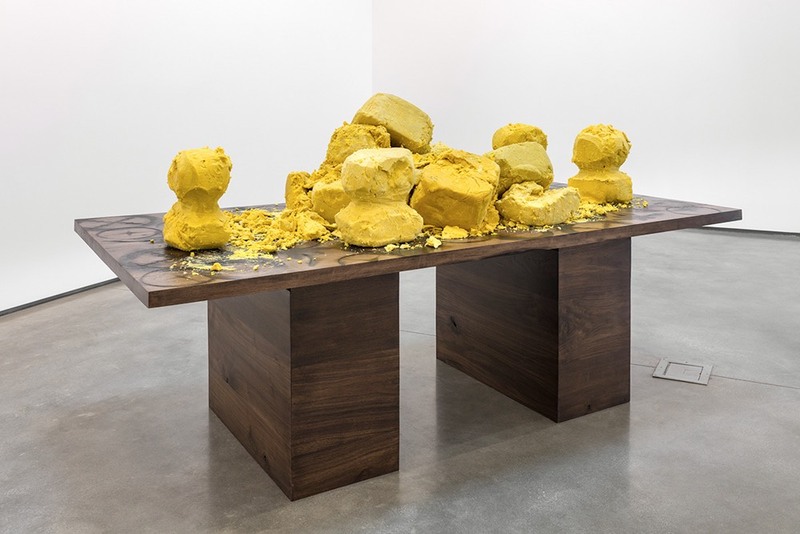 Untitled Shea Butter Table, 2018. Image credit: Rashid Johnson and David Kordansky Gallery. This entry was posted in ART and tagged David Kordansky Gallery Los Angeles, Rashid Johnson on May 12th, 2018 by Barlo Perry.